25G networking has quietly become the building block of enterprise and data center network upgrades. The current wave of 100G upgrades are built on 25G lanes delivering cost-effective 100G networks. 40G networks will remain a staple in the enterprise and the data center for the short term, but 25Gs role in building future networks is bright. 25G upgrades in the enterprise and data center offer advantages over 40G. 25G, SFP28 transceivers offer the benefits of the SFP and SFP+ form factors (low power consumption, common footprint, and density) and use existing 10G cabling. Sporting a single 25G lane, the SFP28 also rolls nicely into future network upgrade standards. 100G QSFP28 and 200G QSFP28-DD each use multiple 25G lanes in their architecture. In contrast to 40G, 25G is being introduced directly to the edge NICs and switches, rather than a line side upgrade. Unfortunately, simply installing an SFP28 transceiver into an SFP switch port does not simply upgrade a port to 25G. Edge devices must be upgraded to support 25G. Upgrading the sheer volume of edge devices in a network will require both budget and time. Advances in transceiver technologies are now available to allow enterprises and data centers to upgrade only portions of their network to 25G while deferring upgrades on other portions into the future. The new SFP28 10G/25G transceiver is dual rate, capable of connecting at 25G or 10G. 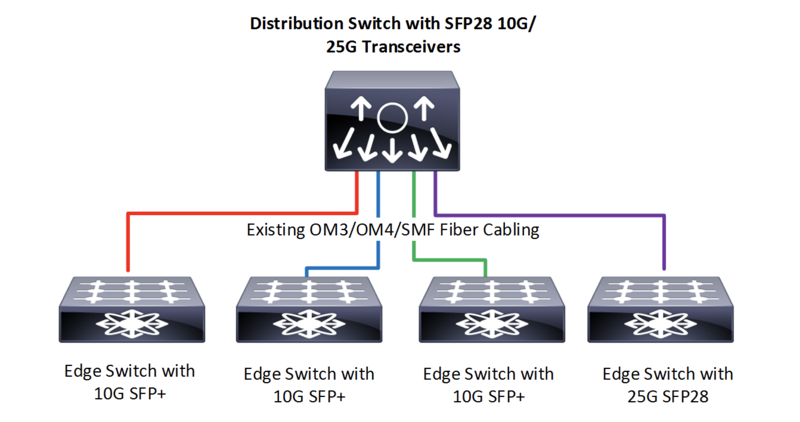 When installed in a distribution or aggregation switch, the SFP28 10G/25G transceiver can connect over existing network cabling with either a 10G SFP+ or 25G SFP28 transceiver installed in edge devices. This approach allows data centers and enterprises to align 25G upgrades of edge devices and NICs with time and budget constraints. SFP28 10G/25G transceivers are available in SR (OM3/OM4 multi-mode fiber) and LR (single-mode) variants. Demonstrating the versatility of 25G, breakout applications separate the transmit and receive pairs from a QSFP transceiver to four SFP-type transceivers. QSFP breakout applications are prevalent in top-of-rack, end-of-row and spine/leaf environments. In 100G networks, aggregating four 25G network devices into one QSFP28 port offers power, port and reduced latency advantages over one-to-one port approaches. 100G to 25G breakout applications are supported by multiple solutions. Transceiver based solutions utilize existing fiber cabling to avoid costly plant upgrades. The QSFP28 SR4 transceiver accepts an OM3 or OM4 MPO-type connector with various breakout cables or cassettes that separate the physical lanes into four transmit and receive pairs to interface with SFP28 SR transceivers. The QSFP28 PSM4 transceiver takes a similar breakout approach but requires an angle polished single-mode MPO-type connector cable to interface with SFP28 LR transceivers. Transceiver breakout solutions are typically deployed in end-of-row and spine/leaf applications, leveraging existing 10G fiber cable infrastructure. Direct Attached Cables (DACs) and Active Optical Cables (AOCs) are ideal solutions for new top-of-rack and end-of-row QSFP port breakouts. DAC and AOC breakout cables have a pre-terminated QSFP-type transceiver on one end with four SFP-type transceivers on the other. 100G DAC breakout cables are widely deployed in top-of-rack applications, connecting a top-of-rack QSFP28 switch port to four SFP28 ports. 100G AOC breakout cables are more common in both end-of-row and spine/leaf applications to overcome distance limitations of copper direct attached cables. 25G solutions offer enterprises and data centers an upgrade path aligned with future network technology while reducing the cost of network cabling upgrades. Click here to contact your local Accu-Tech representative to learn more about solutions from ProLabs.